Now that the old wrist is starting to feel the pains of getting older, I'm looking for a softer recoiling service pistol load for my 9mm. I have an S&W 910, an economy 3rd Gen model that is legal for CMP. It was never intended for bullseye, but with the right loads, I think it could make 2" at 25 Yds. I replaced the plastic guide rod with a steel one from a 5904 and the disconnector as well. This may help a bit with accuracy. So far, I've replaced the factory 14 lb spring with an 8 lb, which will function with my light loads of 3.0 gr Titegroup and a 115 Zero FMJ. Recoil is light, and accuracy at 25 is around 3". From what I've read here, the 9mm gets very confusing with 32" twist barrels, 10" twist barrels, driving the bullets at 1200 fps and down to 700 fps, 90 gr. bullets to 165 gr. bullets. It's hard to make sense out of it all. I believe my gun has a 16" or 18.75" twist, and there aren't any fancy aftermarket barrels for the 910. Will a slow 147 gr. slug group well in that barrel? The idea is to get a soft recoiling and accurate load that will work at 50 yds. hopefully 4". Can anyone offer advice or has experience in this area? 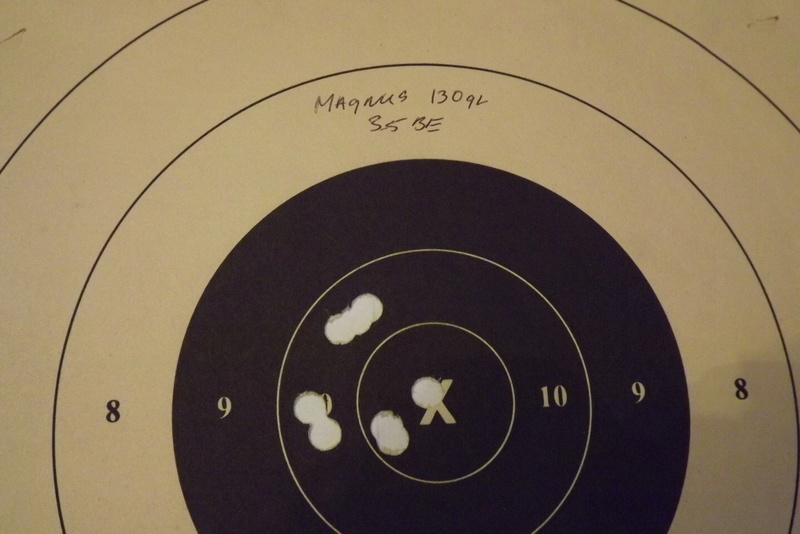 Magnus Bullets makes a 130gr SWC (509) that he will size down to .356 for you upon request. If you want light recoil that is probably your best bet. I load them with 3.5 gr of Bullseye powder. For the 910 you might even try a little batch sized to .357. I have a model 39 the older cousin to the 910 and have played with it trying for the perfect bullet. I never really found it for the 39. The pictures shown are shot with a 952 at 25 yds. The 147gr LFP he sells can also be loaded quite light. These bullets were both loaded with 3.5 gr but with your spring weight you can probably work lower. Please don't try to load a jacketed bullet down lower then these. Thanks LenV. These groups look good, but a 910 is a far cry from a 952. I do like Magnus bullets and will probably use a cast bullet for CF matches. But CMP leg matches require a jacketed bullet. Oldsalt, I posted some of my targets yesterday with 115gr XTP which is my favorite but I do not have any light recoil loads. They have to be pretty snappy to get accuracy. You won't find any after market barrel for the 910 so your probably stuck with what we found works for the RO 9mm. James posted a lower load then mine and liked it. 6.1 gr Power Pistol with 115gr Zero/HAP/XTP. I DO REMEMBER REPLACEMENT BARRELS FOR S&W AUTOS IN THE PAST (25 YEARS AGO OR SO). I BELIEVE IT WAS JARVIS, BUT I CAN'T FIND THEM ON THEIR WEB SITE NOW. Len, that's interesting how a 9mm should be driven fast to be accurate. Seems counterintuitive, but others have said the same. Wonder why 45s and 38s need to be in the 700 fps range to get best accuracy. I'm looking for something like a 38 Spl recoilwise. The RO is a 1911 style and can be match tuned like one. But it seems that with a 910 while a of good S&W quality, is still an economy model and faster loads usually mean bigger groups. But you never know where the sweet spot will be hiding. I just got some Hornady 115 HAP and 147 XTP to try out. All agree that these are some of the best bullets for 9mm. If you want something LIKE a 38 Special, I'd go for a 38 Super 1911. They seem to be able to shoot well at or near 38 Special velocities. A 147 grain LSWC at 800 fps might be just the ticket. Swap out barrels on a 9mm RO. Sig Sauer barrels $40 if you want to play around first. Thanks to all for your advice. In the short time I've been at this 9mm thing, it's proven to be a real eye opener. I tried some 147 gr XTP with 3.0 Titegroup @ 1.150 COL today. 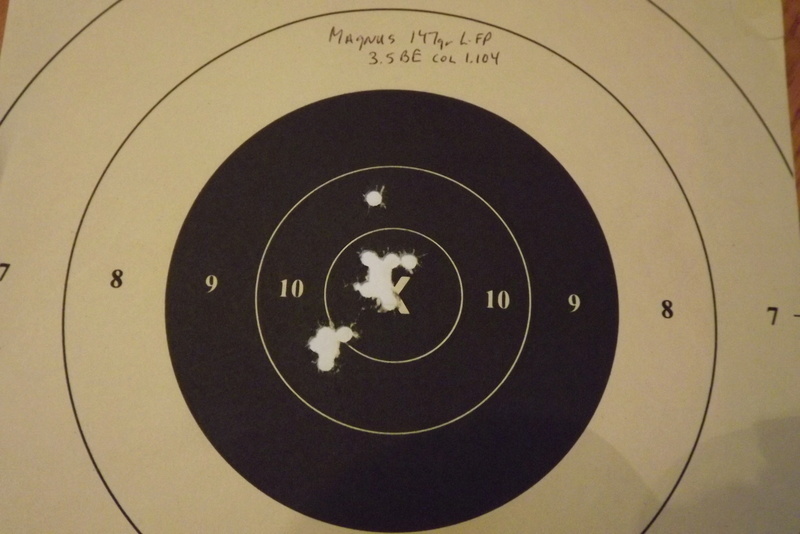 Got 2" groups at 25, which is about the best I would expect from a 910. What amazed me was I tried the same load seated at 1.100" COL as stated in the Hodgdon Manual, and it was terrible, about 5.5". What a difference .040" makes! A 45 doesn't seem to care at all about COL, as long as it functions. And each gun wants something​ different. My RO wanted1.150,my xdm 5.25 mags will only take 1.079.